Environmental Public Works Project of the Year. A system to clean up toxic waste at the old Harrison Road landfill is doing a great job, city and state environmental officials say. And because it's doing a great job for a relatively low cost, the American Public Works Association has cited the Harrison Road Landfill Remediation System as the Environmental Public Works Project of the Year in its category. The category is for projects that cost less than $2 million in contract and consultant costs. 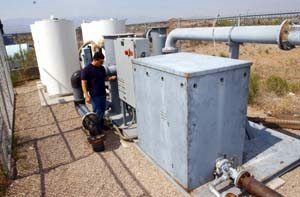 Danny Samorano, project manager with the city Environmental Management Division, said it cost about $1.2 million to set up the system to remove chlorinated hydrocarbons that are seeping from the landfill into the ground water. Including staff time would push the total closer to $2 million, Samorano said. The system was needed because the old landfill had no lining at the bottom to keep the chlorinated-hydrocarbon-bearing substances from leaching out, he said. The city closed the landfill, at Harrison and East Irvington roads, in 1997. The remediation system went into effect in 1998, Samorano said. The primary contaminant in the chlorinated hydrocarbons is PCE, or perchloroethene, which comes from degreasing solvents in refuse dumped into the landfill, he said. The solvents were buried in the 120-acre landfill before federal regulations made that illegal in the mid-1980s, Samorano said. Some monitoring wells at the landfill detected the PCE in 1995, he said. An investigation was begun and completed in 1997; the deep-soil vapor extraction/injection system was designed and completed in 1998. That's pretty quick for an environmental remediation project, he said. Sam Rogers, a hydrologist with the Arizona Department of Environmental Quality's Solid Waste Unit, agrees. "The good news is they've removed a lot of contaminants, and stopped the movement of contaminants from the site," said Rogers, who oversees the Harrison remediation system and about 40 similar projects statewide. "They're doing a pretty good job." The system will have to be in place a minimum of five more years, he added. Karen Masbruch, director of the Environmental Management Division, said she believes this is the first application of deep soil vapor extraction/injection technology to any landfill. "We are thrilled with the recognition" from the public works association," Masbruch said. "I believe that in the next few years, this innovative technology will be widely used as an effective remedial action at landfills throughout the Western United States." Samorano said city officials will accept the award at the public works association's annual convention in Kansas City. · Contact Tim Ellis at 807-8414 or at ltellis@azstarnet.com. The Harrison Road Landfill Remediation System uses three deep-extraction wells around the perimeter of the old Harrison Road landfill, all of them bored down to a point just above the water table. A fourth well, bored into the center of the landfill, injects clean air into the ground, which helps push contaminated vapors toward the edges. The three extraction wells collect the vapors. The contaminated air is then circulated through carbon filters, and the resulting clean air is returned to the atmosphere. The system also helps reduce ground-water contamination with a well that is down-slope from the old landfill, said Danny Samorano, project manager with the city Environmental Management Division. Contaminated ground water is captured in that well and treated with carbon, then injected with bacteria that microorganisms feed on. That water is then reintroduced into the aquifer, Samorano said. The ground-water cleanup system works well with another system to deal with an additional problem caused by the Harrison landfill, Samorano said. That is methane gas, which is produced naturally by decomposing garbage at all landfills. At sufficient concentrations, methane can cause explosions. The city must monitor methane production at landfills to make sure it doesn't migrate through the ground to adjoining properties, as it did in the early and mid-1990s. The city also must report excessive levels of methane to the state Department of Environmental Quality. Samorano said the two systems work well together to prevent pollutants from seeping through the soil, horizontally and vertically, down into the water table. "It's pretty cost-effective technology, and when compared to similar sites, it's a winner," Samorano said.